Celebrate NexPet’s 20th Anniversary at our 2019 National Convention!! Earn six months’ FREE MEMBERSHIP* or Membership renewal if you attend full program–a $250 value! Plus, Omaha Steaks & Fish worth up to $199 if you buy! 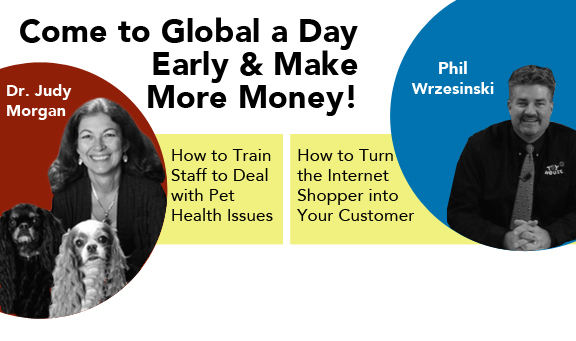 Phil Wrzesinki “How to Turn the Internet Shopper into Your Customer” Phil wowed us with a great talk at our 2015 Convention. Since then, he has become an expert in helping independents compete with online shopping. Mini-show 3PM-6PM with one-on-one timewith Phil & Dr. Morgan, as well as owners and principals of NexPet product and service vendors. Better deals than at main show, including double cashback on pet food. Save time at the main show!